Garlic mustard is a herbaceous biennial. First year plants will form basal rosettes and remain green through the winter. Second year plants can grow up to 4' tall and produce on to several flowering stems. Leaves: First year leaves are dark green and heart or kidney shaped with a scalloped edge. Second year leaves are alternate and triangular. They will have large teeth and will smell like garlic when crushed. Flowers: Small, white flowers bloom throughout the spring. Fruits & Seeds: Seed pods are green, long, and thin. They hold many small black seeds. Roots: White, and "S" shaped at the top. Garlic mustard will resprout from the root crown in only the top of the plant is removed. 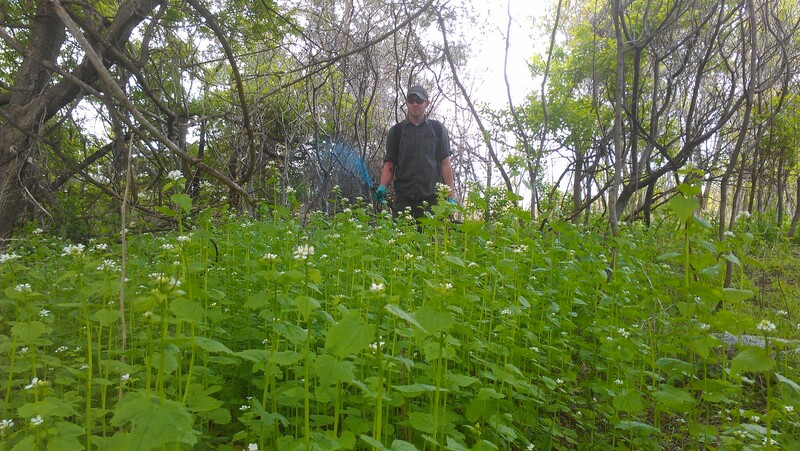 Garlic mustard rapidly invades forests, woodlands, and oak savannas. It prefers shade but can be found in sunlight.